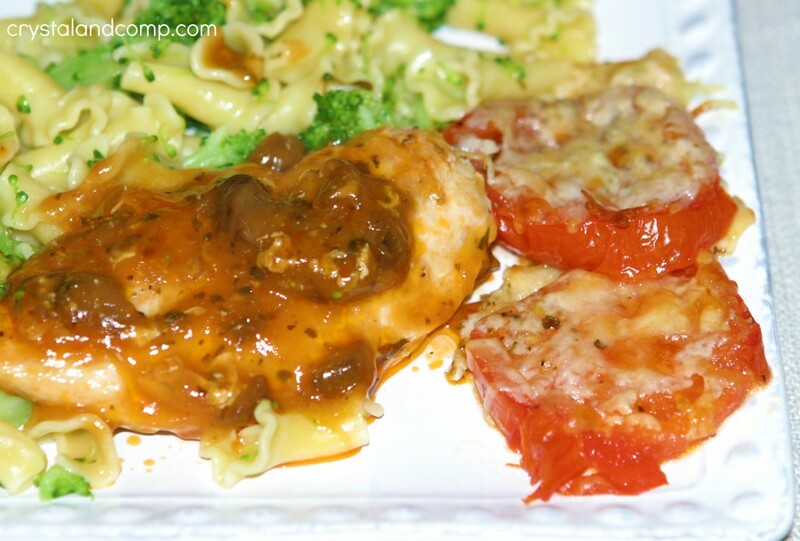 Here is a super easy recipe that went perfectly with a pasta and chicken dinner we had recently. Three to four whole tomatoes really can go a long way when you slice them, season them and roast them in the oven. 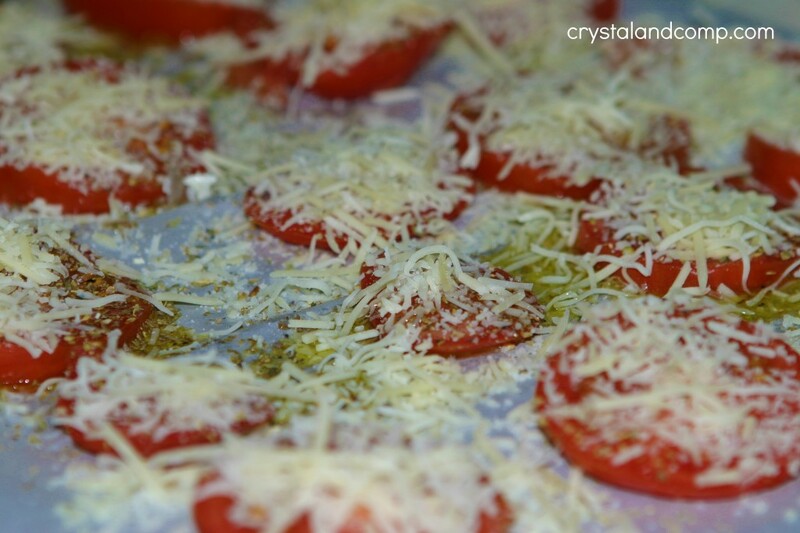 Place your tomato slices on a cookie sheet about half and inch a part from one another. 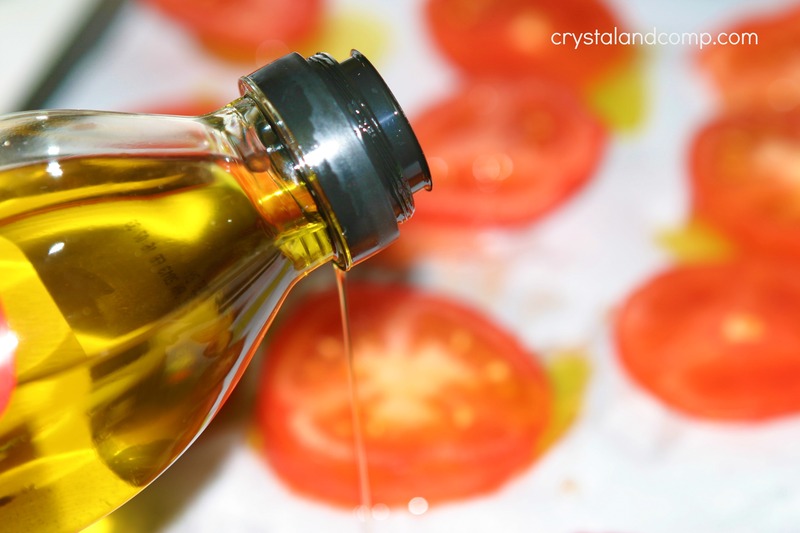 Drizzle them with olive oil. 2-3 T should be enough for all of the tomatoes. 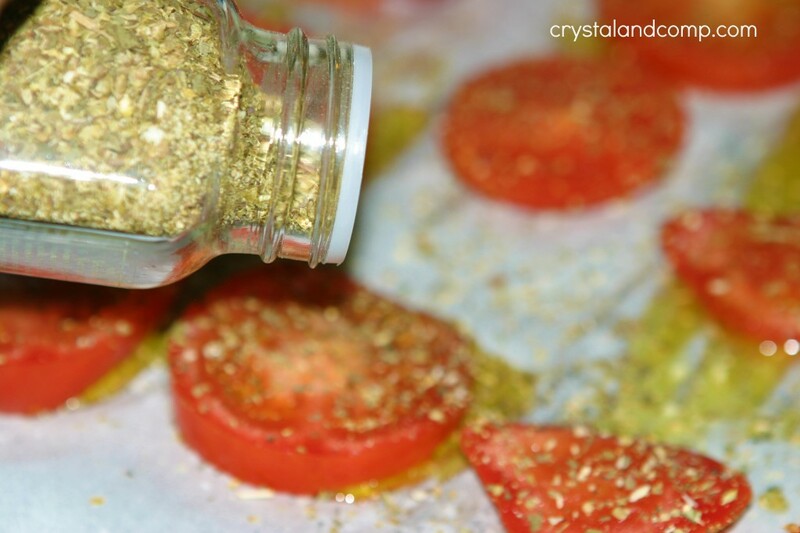 Sprinkle each slice with a few shakes of Italian Seasoning. 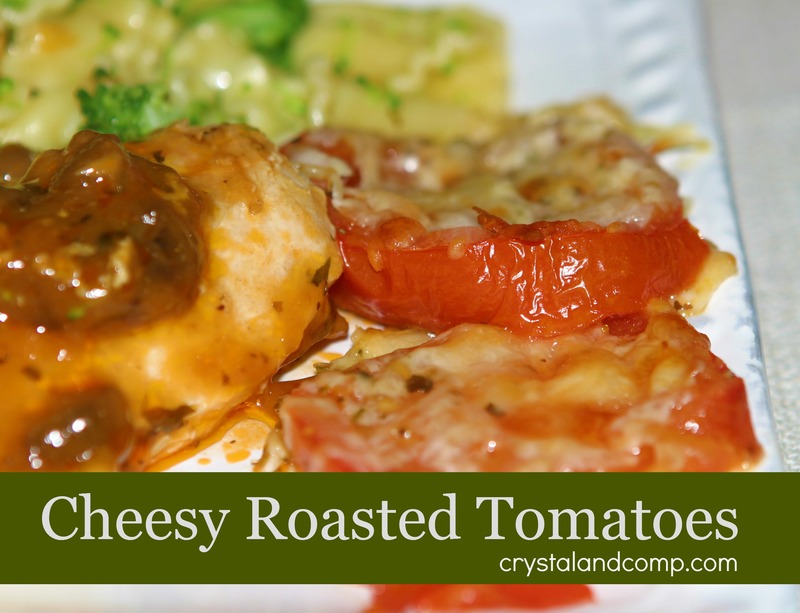 Top each tomato with your favorite shredded Italian blend of cheese. I used a Mozzarella and Parmesan blend. It was perfect. Pop it in the oven on 450 degrees for 15-20 minutes, until the cheese is bubbly and brown. Look at how amazing those tomato slices look. Serve 2-3 slices as a side on each plate. These went perfectly with a Chicken Marsala recipe we made recently. 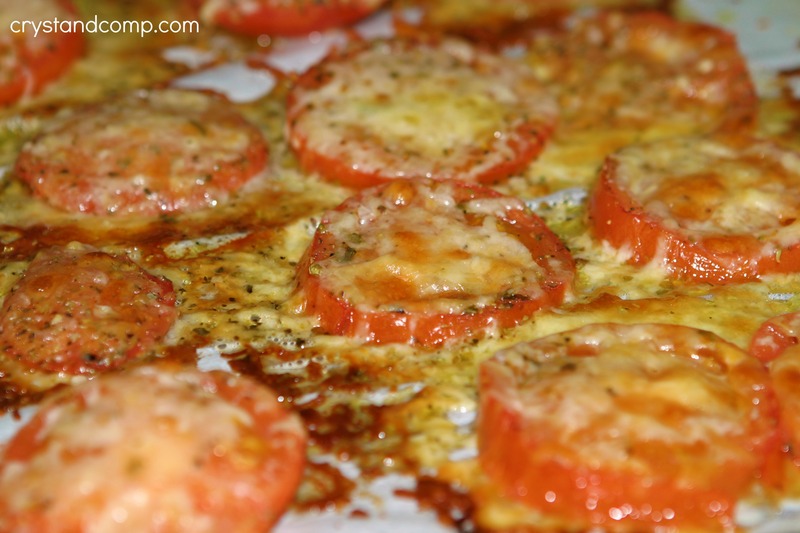 These look so delish – I love baked tomatoes! I came from Menu Planning Monday! Thanks Mika. They were yummy! These look so good. I can’t wait to give them a try! These tomatoes look amazing! I can’t wait to make this with fresh tomatoes from our garden. This recipe was featured in Krafty Cards etc.’s Recipe Round-up. View it at: http://kraftycardsetc.blogspot.com/2013/04/recipe-round-up.html. Thanks for the inspiration! Thanks Maria. They were great! I was working in the tomato patch yesterday and dreaming about all the fresh tomatoes we will soon have. This will be a great recipe to try. Thank you very much for sharing with Full Plate Thursday and have a great week!